Juicers can be broken down into three categories: citrus juicers, masticating juicers, and centrifugal juicers or sometimes simply referred to as all-purpose juicers. Citrus juicers, or manual juicers, use a reamer to press the juice and pulp out of oranges, lemons, limes, etc. We recommend the Cuisinart CCJ-500 Pulp Control Citrus Juicer. Masticating juicers, also known as slow juicers or cold press juicers, use a single auger or twin gear system to squeeze the juice out which is really effective on leafy greens. The all-purpose juicers use a swirling blade to chop the fruits or vegetables then a centrifugal operation, or in simpler terms, spun to separate the juice from pulp. For this review we are going to focus on the masticating and centrifugal kitchen appliances which we compare below. Some of the important features most users look for include the overall ability to extract the juice, ease of use, how easy is it to clean and are the parts dishwasher-safe, a wide feeder chute, and durability/warranty. Below we review our top 10 best juicers. Professional juicers can cost from $500 to over $1000, so for this review we only focused on household units that cost less than $400. We also provide a juicer comparison chart after the juicer reviews. If you need more information before making a purchase check out our Juicer Buying Guide. 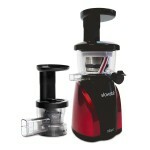 We chose the Omega NC800HDS Premium Juicer and Nutrition System as the best juicer. The Omega NC800HDS is a newer version of the Omega J8004 or J8006. The main improvements are a larger feed chute, a ‘dual staged’ auger, and a pulp pressure adjustment. The larger 2″ x 1.5″ feed chute is the main difference users will notice since you don’t have to chop up all your produce as small. It produces excellent juice yield which is about the same as the J8004. The Omega NC900HDC does cost about $80 more than the J8004, but we feel for the most part it is worth it. Overall it really excels with hard produce and leafy greens, but it can struggle a bit with soft fruits. By the way the NC800 is the same as the NC900 except for looks and cost, the NC900 is chrome and costs about $50 more. The Tribest SW-2000-B Slowstar is another outstanding masticating juicer. This vertical single auger machine turns at a slow 47 RPMs which means less heat, less foam, and more nutrients and enzymes while still yielding more juice than almost any other model – maybe just a tad less than the Omega NC800HDS. It is also versatile since it can handle greens, soft fruit, hard vegetables, and also comes with a mincer attachment that can let you make sorbets and nut butters. The Tribest Slowstar, although tall, takes up a small footprint of just 8 x 6.5 inches, while the feed chute opening is 2.5 x 1.5 inches which is wider than many other masticating type units. It is relatively easy to clean, although the parts are not dishwasher safe. Overall we would recommend the Tribest Slowstar for all users due to its design, power, and versatility. Breville’s newest and best centrifugal juicer is the Breville Juice Fountain Cold XL BJE830SIL1BUS1. 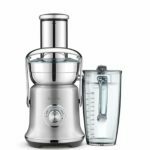 The juice yield still does not quite compare to slow masticating juicers, but it is among the best we have seen for a centrifugal juicer. Some improvements over other similar models include cold spin technology which prevents the juice from getting warm and a Quiet setting that reduces the noise by up to 40%. The BJE830SIL1BUS1 can extract 70 ounces of juice into the included container up to 5 times faster than a cold press juicer. 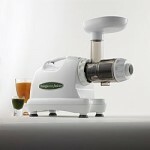 It also has a 1200 watt motor and the largest feed chute of any juicer on our list with a 3.5-inch diameter. Cleaning is pretty easy since most the parts are dishwasher safe. 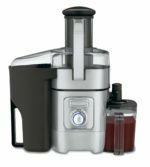 If you prefer the quick results from a centrifugal juicer and want the best regardless of price then the Breville Juice Fountain Cold XL is for you. The Breville Juice Fountain Elite 800JEXL is an older Breville offering, but it still packs a punch with its 1000 watt motor while costing about $90 less than the Juice Fountain Cold XL. It only has 2 speed settings, however. The Breville 800JEXL is very will built and sleek looking so you won’t mind leaving it out on your counter. This model has a large 3 inch feed chute to accommodate whole fruits and vegetables which it will devour with ease. It is also super easy to clean and most of the parts are dishwasher safe. Users on Amazon also really like it with a 4.4 star rating and we think you will too which is why we would recommend it to anyone looking for a centrifugal juicer. The Korean-made Hurom HH Elite Slow Juicer is another masticating juicer that we would not hesitate to recommend. In testing this model yielded the most green juice of any tested, but yielded lower amounts of carrot-apple juice. This vertical, single dual-edged auger machine produces low-foam juice very quietly. The HH Elite also comes with a control lever and fine and coarse strainers that allow you to control the amount of pulp to suit your taste. It also has a unique internal cleaning spinning brush that rotates to clean the chamber and strainer simultaneously, reducing clogging and increasing juicing efficiency. Slow juicers are quite expensive, but if you want a cheap masticating juicer then we recommend the Omega J8004. This thing provides an amazing value since it is about $80 cheaper than top-tier models like the Omega NC800HDS while the performance only rates slightly lower than those same units. You can also get the Omega J8006, which is identical except in appearance – this one is white while the J8006 is chrome, however the J8004 is about $20 cheaper. This horizontal single auger unit has a larger footprint, 16 x 7 inches, but excels at extracting juice from hard fruits and vegetables. Although it is only average in yield from softer produce. The feed chute is narrow with just a 1.5 inch diameter, so you will need to spend some time chopping your produce down. However, you can save some time on the back end since it is probably the easiest slow juicer to clean. 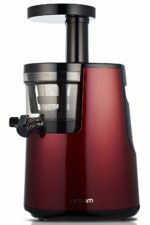 So if you are looking for a more affordable masticating juicer than the Omega J8004 is the one for you. The Breville Juice Fountain Cold BJE430SIL is another new juicer available from Breville. It also uses the cold spin technology to ensure an insignificant temperature increase. There are two speeds – high speed for dense produce at 13,000 RPM and a low speed for leafy vegetables and soft fruits at 6500 RPM. Other features of the BJE430SIL include an 850 watt motor, 3.4L pulp bin container capacity, and 70 oz seal and store juice jug. Overall it is easy to use and easy to clean, especially since most parts are dishwasher safe. On the downside the juice yield is just slightly above average with wet pulp left over, and really poor on greens like kale or spinach. Therefore the Breville Juice Fountain Cold is best for anyone who needs speed and ease-of-use over quantity of juice extracted. The Cuisinart CJE-1000 is a 1000 watt, 5 speed juice extractor with a large 3-inch feed chute. It also has a foam reducing filter basket, 2 L pulp container, and a 1-quart juice pitcher. Most of the parts are dishwasher safe. Overall it is a bit polarizing to users. It has more 1 star ratings than most other juicers on this list, but it still rates at 4.1 stars average on Amazon. The biggest complaint is that the pulp is still wet and thus the juice yield is not good. The Cuisinart CJE-1000 is far from perfect, but compared to other centrifugal juicers we think it is still a pretty good juicer for the price. At the time of this publication the Mueller Ultra-Juicer was the best-selling juicer on Amazon. We think it is the best centrifugal juicer under $100. Mueller claims it can make a 16 oz cup of juice in just 8 seconds. This thing has an 1100 watt motor and two speeds – a low speed that runs from 12000 to 15000 RPM and a fast speed that runs from 15000 to 18000 RPM for harder fruits and vegetables. It also has a large 3-inch feed chute. Like most centrifugal juicers the biggest complaint is that it leaves a lot of juice left in the pulp. 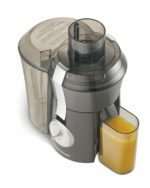 However, we think the Mueller Ultra-Juicer is a solid basic juicer and provides a good value for the price. 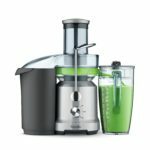 If you want a cheap juicer or budget juicer then you might want to consider the Hamilton Beach 67650A. For the price we think it is a solid buy, but it is not in the same range as the Breville models. Although it can handle some fruits OK, it will struggle to extract juice with many vegetables and some soft fruits. This leaves a lot of wasted, mushy pulp behind. If you are just making fruit juices the Hamilton Beach 67650A will work for you, but if you want vegetable juice we recommend spending more money. Buyers should be aware that once you get down in this price range the performance really drops off – they just are not very efficient at extracting juice. 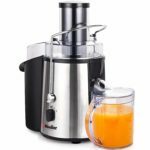 Mueller Ultra-Juicer 8.7 $89.99 Centrifugal 1100 watt 3″ Circle Some 2 years 15.25″ x 8″ x ? Type – Which style of operation you want in your juicer depends on the produce you plan to use in it. If you are juicing wheatgrass or other fibrous greens then go with a masticating juicer. If you primarily will be using fruits and some vegetables then go with a centrifugal juice extractor. Extraction – Slow juicers will extract more juice than centrifugal models, especially on leafy greens. Feeder Chute – You can only fit produce that is as wide as the feeder into the juicer. So a wider feeder chute will result in less chopping and dicing ahead of time. Clean-Up – Juicers are extremely messy inside. Find a model that users say is easy to clean and just as important that uses parts that are dishwasher safe. Speeds – Multiple speeds on a centrifugal model make it easier to get the desired result on a variety of produce. An extra slow speed can help with greens on this type of unit as well. Motor – All of these appliances rely on a motor to work. The best centrifugal models have over 900 or even 1000 watts of power, meanwhile average models have about 700-800 watts. Masticating versions will have a motor with less power – around 150 watts. Size – People are often shocked how large some juicers are. So know how much space you have where you want to store it and make sure it will fit. Remember a horizontal slow juicer will take up more counter space than a vertical machine. Noise – The centrifugal juice extractors are often quite noisy. Look for a quiet model if this is an issue for you. Time – How much time do you have to juice? Masticating juicers take much longer to work than centrifugal models. If you are in a rush go with a centrifugal version. Pulp – Do you like a lot of pulp in your orange juice? If so look for a citrus juicer with a filter or pulp regulator that lets you control the amount of pulp that ends up in the juice. Heat – The centrifugal units often produce a lot of heat while in use. For some users this is problem. If you want low heat go with a masticating version.